Honda launched the BR-V in India at Rs 8.75 lakh. Based on the same platform that underpins the Mobilio, the BR-V gets a sportier design which is inspired by the flagship CR-V, and the interior too gets a plusher feel with additional features. However, the prices of Mobilio (Rs 7.10 lakh - Rs 12.25 lakh) and the BR-V (Rs 8.75 lakh - Rs 12.90 lakh) are closely stacked. Also, last month, Honda sold a mere 374 units of Mobilio. 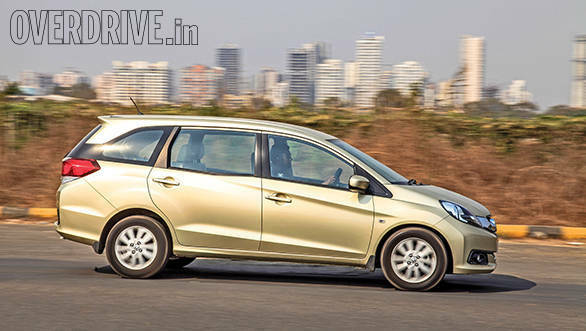 Does it mean that Honda will eventually pull the plug on the Mobilio? We caught up with Jnaneswar Sen, Vice President - Marketing and Sales, Honda Cars India Ltd. to know more. When asked if Honda plans to discontinue the Mobilio owing to its discouraging sales numbers, he denied it by saying, "There are no plans of discontinuing production, and we plan to continue selling it." He further added, "The segment where the Mobilio is placed has been declining. When we had planned the Mobilio, we only considered the personal usage and not the fleet segment. The commercial fleet segment is much bigger. And presently, Honda doesn't have a strong presence in the fleet operator business because of its brand image. Even though we sell cars in the commercial segment, we haven't promoted it sufficiently which will now change as we plan to be aggressive in that segment with the Mobilio." We believe that this decision will benefit Honda in two ways. First, the Mobilio might see stronger sales numbers. Second, the company can also take advantage of the registration ban of diesel vehicles with a displacement of 2.0-litre and above which has heavily impacted the commercial operators in New Delhi. While the Mobilio cannot be considered a suitable replacement for the Innova, it can surely be of some help as it is the most spacious in its segment and at the same time the most fuel efficient too. Honda can top it up with an attractive discount too.